When it came to choosing our army compositions one of my first thought – past knights, warriors and Skullcrushers – was the need for Warhounds. As my army had a powerful urge to go hooning off to kick and mang face regardless of whether or not it’s a terribly sensible, or safe, idea it was obvious that Warhounds would be needed to both deal with warmachines as well as protect my flanks from cavalry, or at least, slow them down for a turn. I actually have a couple of Warhounds that I’ve used for my Witch Hunter Mordheim warband but I converted them so never really took the time to appreciate them beyond fulfilling a need that didn’t require me using the utterly awful hound models available from the Mordheim range, now lost to the ages. Back when I last rolled dice in anger with a Chaos army I had two units of the metal Warhounds and I must be honest, they were some of my favourite models. From the posing to the casting quality they were some of the best models around at the time. They were quick to clean, easy to build and fun to paint so I must admit to mixed feelings about using the new plastic Warhounds instead. This was mainly because they were a big change from the old models. The metal models were very much a case of mutated hounds or wolves. Feral dogs that had fallen foul of Chaos. The new ones, however, didn’t quite tell the same story. Instead, and rightly so, the new Warhounds are now creatures that exist in the Northern Wastes, their bodies twisted by mutation, their form evolving to into powerful, vicious killers. The fact that the models are now plastic is a bit of a double-edged sword because, on the one hand, the variety of tales and horns means that you can get a surprising amount of variety in the models when mixed and matched across all the various poses the dogs are in. This means that, in theory, two units should look suitably different. The downside is that the sculpting and the layout of the frames were a tad on the lazy side which means that the big shaggy manes lack definition in places, coupled with scrunched up features the overall effect is a tad comical. It does resolve itself once you start slapping paint on them but I can see it putting some off. The other thing is that the bodies come in two halves which means a join line runs along the length of the model which does mean the muzzles of the Warhounds are spoilt a bit but considering they’re only 6 points a model and will never see the end of the game it’s not worth putting in the work to plug the gaps. And I suppose that’s the compromise. 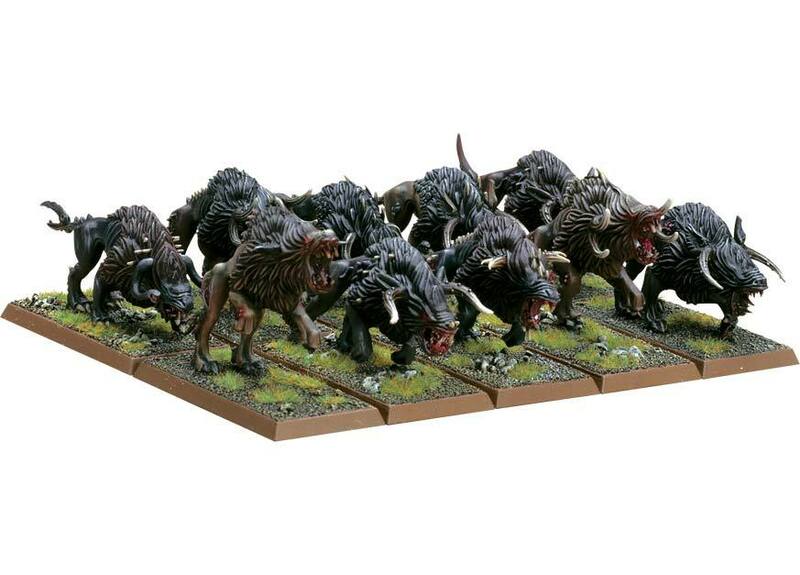 For the money you get a full unit of Warhounds that look good – slight bugbears aside – that’ll be quick to paint and will do the job they’re intended to do once on the board. Even when I worked for the company a unit the same size would have cost a lot more. Yes they’d have been metal and yes they probably would have looked cooler but it’s a changing world and had they not been re-released as a plastic kit they would have gone up further in price or been turned into Finecast and no one, in their right mind, would buy them for the cost alone. And that would be a shame because for the points Warhounds are fantastic. They’re quick, they’re better than the average human in a fight, they’re cheap and that means reasonable units to run interference and tie up Imperial Knights who, thanks to the new rules, won’t strike first. Which in way is quite cinematic. Noble knights charging forward in the name of Emperor and country only to get pounced on by a park or rabid and starving hounds, the need to feed overriding any sense of self-preservation. And they don’t count towards your total force allocations. And the cherry on the cake is that you can give them upgrades. Like Scaly Skin. Granted percentile-wise the increases are quite high but the overall cost to the army is low and potential rewards significant. Obviously in small games you’d never bother but there’s definitely benefit to juicing your dogs in bigger games as holding up a big expensive unit for a turn or two with a comparatively cheap and worthless unit of dogs is a huge tactical boon, especially to the army I’m collecting. For the money and for the point Warhounds are ace. The models aren’t perfect and to get the best out of them warrants more attention than their points value deserves but it’s a preference thing at the end of the day. You can do an outstanding job on them because they have the detail on the heads to really make each one pop, I just doubt I would. Regardless of how I paint them they’ll be in my army in spades because they’re just too good not to. Chaos Warhounds are available from Firestorm Games priced £13.95.